Illustration of the life stages of the southwestern corn borer which undergoes a complete metamorphosis: egg – larva (borer) – pupa - adult. Eggs are laid on both the upper and lower surfaces of the leaves and stalk of the host plant. Female moths typically prefer maize plants of intermediate size as sites for oviposition. Each female lays from 100 to 400 eggs, either singly or overlapping one another in masses of several eggs. Borers show a seasonal polymorphism. Summer-form borers are off-white with black pinacula, whereas winter-form borers are uniformly light yellow due to their pigment-free pinacula. After passing through at least five stages, summer-form borers pupate without any prior loss of cuticular pigments. In contrast, fully grown borers programmed to overwinter (diapause) molt from a spotted to a pigment-free morph. Borers show a distinct behavioral pattern as they prepare for overwintering by migrating to the base of the stalk below ground level where they prepare an overwintering cell. 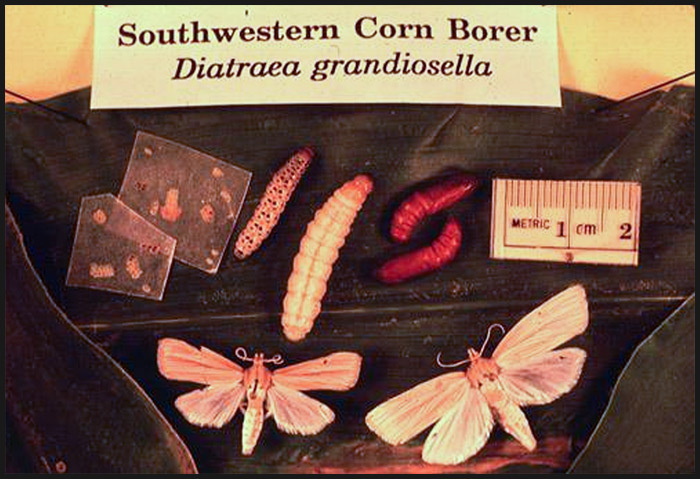 From 1970 to 2002, together with his colleagues, students, and staff, G. M. Chippendale published 80 research articles on different aspects of the physiology, biochemistry, ecology and management of the southwestern corn borer, Topics included were nutrition, feeding behavior, growth and development, endocrinology, photoperiodism, and biorational control. A complete listing of these research articles is provided under the communications tab of this website.